Jeff Alworth, author of the excellent Beer Bible, said: “Jackson’s greatest contribution was writing about beer as a product of culture. He is regularly credited with having given currency to the idea of ‘style’, and perhaps rightly so. This was a downstream effect of his larger work, though. It’s hard for me to even imagine how difficult his work would have been, driving around the Belgian countryside, stopping into funky little breweries, and trying to figure out what in the world he was drinking and how it related to anything else. He had no internet, no information, nothing but paper maps. A lesser writer wouldn’t have looked at the threads connecting those beers to the people who made and drank it, and wouldn’t have then led to the deep thinking that resulted in his ideas on style. “He’s dinged for getting some stuff wrong, and obviously he did. He got some of the history wrong, and he got some of the styles wrong (it doesn’t make much sense to divide English browns or the tart red-brown beers of Flanders). But he got stuff wrong because he was doing such a tremendous amount of work. As a one-time scholar, I know that the process is one of creative destruction –contemporary work will always give way to the next generation when better information comes along. But creating the framework in which all that work happens is something very, very few people get to do and we are enormously lucky that Jackson was the one who did it for beer. Freud’s theories about the mind are largely discredited now, but he remains such a large figure because he gave us the context of psychotherapy. Jackson’s our Freud – but one who got a lot more right. “The man was also a gorgeous writer. This is never mentioned, but it was critical to his success. In ways small and large, so many beer writers unconsciously echo the way he wrote about beer. It was literary but clear and always evocative. Here in the US especially, Jackson’s writing was critical in sparking craft brewing. The people who were involved in good beer in the 1970s and 1980s were romantics, and they fell in love with this world Jackson described; they wanted to be a part of it. That’s one of the most obvious ways the old guard differ from the new guard; the latter are more pragmatic, flinty, and knowing. The old-timers just wanted to become Dupont. “I can’t guess what Jackson would have made of the past decade. There was always a strong element of the reporter in Jackson, and he was reporting on this great story of “beer” until he died. It has changed and I’m sure he’d have had evolving thoughts. He did seem to find wonder in the world of beer, and I doubt seriously that these years would have dimmed his astonishment. But exactly what flavour of wonder he’d have had – well, sadly, we’ll never know. I would bet my bottom dollar that it would have been worth reading, though. Mitch Steele, like Alastair Hook, also owned up to being massively influenced by Jackson in his career as a brewer: “Back when I was starting out in a pub brewery, San Andreas Brewing Co in Hollister, California) in the late 1980s and early 1990s, very few people in the US knew much about the beer styles of the world. Homebrewers, who by and large were the people that were starting brewpubs and breweries at the time, had learned almost exclusively from British homebrewing books, so the beers most of us made were English-inspired ales. We all looked at Michael Jackson with extreme reverence – he had travelled the world and written about so many different types of beer, and really was the first person to categorize the beer styles of the world with names and descriptions of what the beers should be. His World Guide To Beer was my bible for many, many years, certainly well into the late 1990s. I used that book all the time when I was in charge of New Products at Anheuser-Busch, I used it to develop recipes, and I used it to educate the team at AB, because all they really knew was American and German lagers. 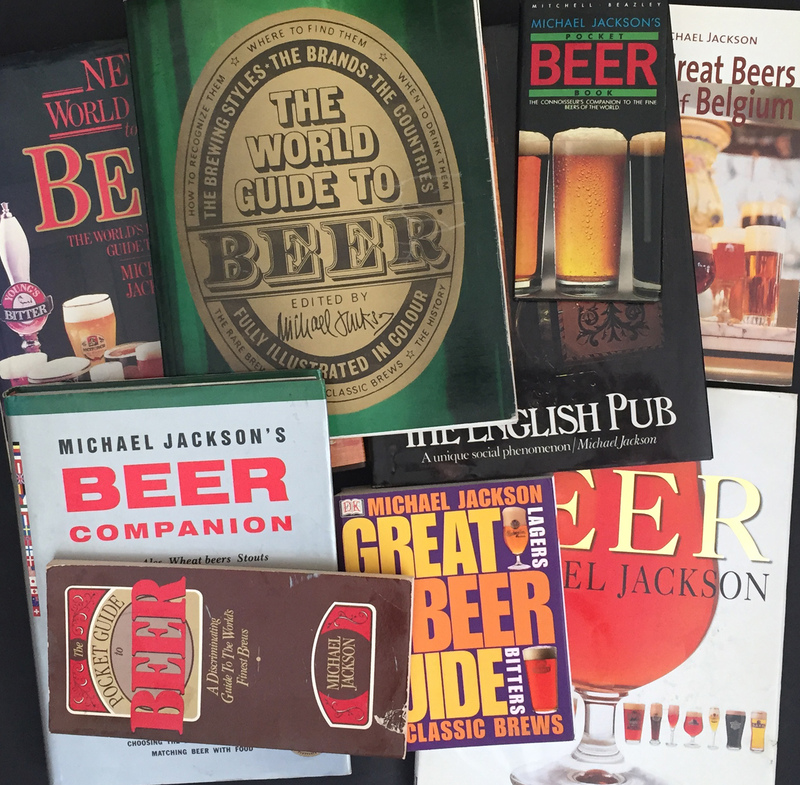 Later, Michael’s Jackson’s Beer Companion book further defined beer styles and became an excellent resource for me. “In 1990, the Association of Brewers (now the Brewers Association) organised a west coast brewery tour with Michael Jackson, and they all came to our little brewpub. I took off early from my day job to be there, and brought my World Guide to Beer for him to sign, which he did. We served him a bunch of beers, and he liked them well enough, and even wrote us up in his Pocket Guide to Beer, which was a great thrill. We found out after the fact that he would’ve been much more impressed if we had given him some food! It didn’t even cross our minds, we were so concerned about whether he’d like our beers or not. But he did make special mention of a woodruff ale we had brewed for the springtime, which was really great. So: Michael Jackson, very important, yes. But indispensable? If Jackson had never lived, would we now be living in a world where all our beer is supplied by less than a handful of global megabreweries, as suggested in the cartoon up at the top there, published just after his death? No, I don’t think we can say that. He did a huge amount to popularise the beers of Belgium, for example, but Tim Webb has done arguably almost as much with his series of guides to the country, and while Michael might have been the person who introduced American brewers to the thrills of geuze, saisons and sour brown ales, they would have discovered those delights on their own anyway, eventually, through someone like Garrett Oliver, or Stan Hieronymus, or Tim. Still, do we miss him? Yes, I do, certainly. I would absolutely love to be able to read his views on the past ten years of developments in beer. They would, without a doubt, be interesting, erudite, thoughtful and entertaining. As it happens, this year I am the same age as Michael was when he died, 65. That, I can assure you, is far too young an age to go. I interviewed Michael for Off Licence News in about 1995. It was at a time when the big breweries were taking an axe to their ranges (I used my favourite headline “brews for scythe” rather too often) and the head of Bass’s take-home division in particular was very vocal about why there were too many beers in the market and consolidation was both inevitable and desirable. Of course, he was bang on the money, and I had the best intro to any of the profile pieces I wrote for OLN, mercifully asterisk-free too. Not sure the ad team were quite so chuffed. Tremendous tale, Graham, thank you very much for telling it. I agree with your underlying hypothesis: beer had become too consolidated and too monochromatic to stay as it was. Every other consumer product category went from a desperate mass market state to one with choice, creativity, and small players. It’s hard to imagine beer alone missing that transformation. MJ shouldn’t be credited with the transformation. But what effect did Michael have on guiding that transformation? What if the first wave of craft brewers in the US hadn’t been romantics, but disinterested businessmen who saw an opportunity in the market? We’ll never know, but I suspect that part of his legacy is profound. I agree, Jeff. Beer would likely have followed a similar path as wine did 10 – 20 years earlier. But, MJ provided structure and form. In retrospect, Michael was a catalyst for the change. I feel certain that a 21st Century beer world would have offered a much less interesting variety of choices without MJ. It flabbergasts me that so many newcomers to the industry don’t even know who he was, much less the debt they owe him for his knowledge and efforts. Sometimes it’s Bowie, sometimes it’s Eno, sometimes it’s Iggy, but someone, whomsoever, is supposed to have said that the Velvet Underground’s first album didn’t sell that many copies, but everyone who bought it went out and started a band. The World Guide To Beer was like that I think, and Alastair reading it and going out and starting Meantime (not straightaway) kind of illustrates that. Personally, meeting Michael three times, through my employment at Meantime, was a great pleasure and a privilege. One of my proudest moments as a brewer was being in Meantime’s Union pub, watching as Michael tasted a beer that I had brewed. (A smoked Bock, for the record). He liked it, or at least said he did. Even in waterlogged Houston, Texas, I feel the loss on the tenth anniversary of his passing. My staff & I drank a toast yesterday in his honor. I met Michael in 1982 at the American Homebrewers Association National Conference. I felt like I had met a rock star (only better!). We attended what is now recognized as the First Annual Great American Beer Festival. Michael never seemed impressed with his own stardom here in the US. He was very down to earth. He & Paddy even allowed this Texas homebrew shop owner to sleep on his floor after a conference in Cambridge a year later. Whenever we would meet, he would ask about my wife whom he met once. How he ever recalled her name I’ll never know. Not only hugely influential, but a great human being. I miss him dearly! I still use his videos in my beers class at UNLV. Sure, he got some stuff wrong, but who cares. It’s the journey that matters, and they say 10% of what we learn is proven wrong every year. Without Michael, the beer world would be a lot dryer place. I don’t disagree with the contributions mentioned by people such as Tim Webb and Garrett Oliver, to which many more names can be added, especially Fritz Maytag, Jack McAuliffe, Charlie Papazian, Richard Boston, the founder of the Ringwood consultancy, Bert Grant, Ken Grossman, CAMRA ‘s founders and What’s Brewing, Roger Protz, Alastair Hook, All About Beer magazine in the U.S. But almost all of them worked in a post-Michael Jackson universe. Would they have been what they were without him? I don’t think so. Compare AAB pre-Jackson to post – it’s like two different worlds. Roger Protz, a talented writer in his own right, has to his credit always been very complimentary to Jackson – he knew how important he was. It’s impossible to know what would have happened to beer without Jackson. All we can be sure of is he came along at exactly the right time and wrought a revolution. I think it’s a bit English-language-centered to see Michael Jackson as the one great author who had the brilliant idea to write about beer. Michel Iacta’s ‘Guide international de la bière’ was published in Paris as early as 1970. That same year Marcel Franssens wrote ‘De Geuzelambik: een levende historische getuige’, which sparked off the revival of lambic. 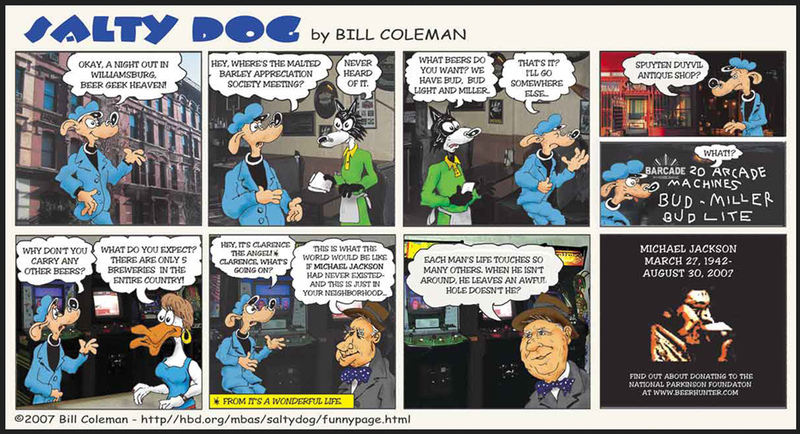 Just because it wasn’t in English, it doesn’t mean that people weren’t already becoming aware of the richness of beer…. When I was working at Carlsberg I got a phone call from someone who didn’t know what to do with ‘some English journalist’. It turned out to be Michael and the marketing department were refusing to help him because he didn’t want to write about Carlsberg Pilsner, but was more interested in the lesser-known beers that weren’t available outside Denmark. Horrified, I rang around all the brewmasters to hear if they would be interested in having a beer and a chat with him. It turned out that the only one who was interested was Anders Kissmeyer. (I couldn’t make it). The result of that trip was Carlsberg 47 getting a mention in one of his books, a container-worth of the beer sold to his beer club and a very fruitful relationship for a good few years. I only met him the once when I brought over a brewmaster and some crates of Gamle Carlsberg for a Guild event in London. No help from the brewery and I more or less had to carry everything myself! Thankfully, Carlsberg has woken up since then with regards its heritage beers. Very interesting, Arnold. I believe I recall that guild event – was there a screening of part of the TV series about the Jacobsen family, or was that anothe event? That was another one. The one I set up was the yeast one. Some great thoughts here. It’s interesting to speculate on what would happen to the general awareness of brewing among the general public (rather than just those who were inspired to go out and start their own business). His books have sat on the shelves of households for years now, inspiring at least a reminding glance with a pint every so often.